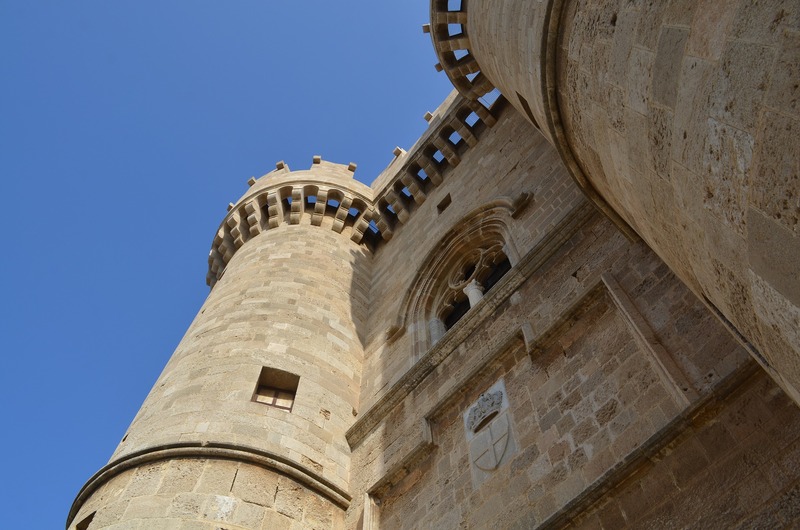 Rhodes, fourth largest of Greece’s Islands, is one of the best known, and one of the first that attracted mass tourism. It’s full of major sites and large resorts, but one of the best ways to get the most out of this big island is to explore its quieter side: its wilder beaches and remote corners, an inland forest and lake, and even more mysterious destinations. 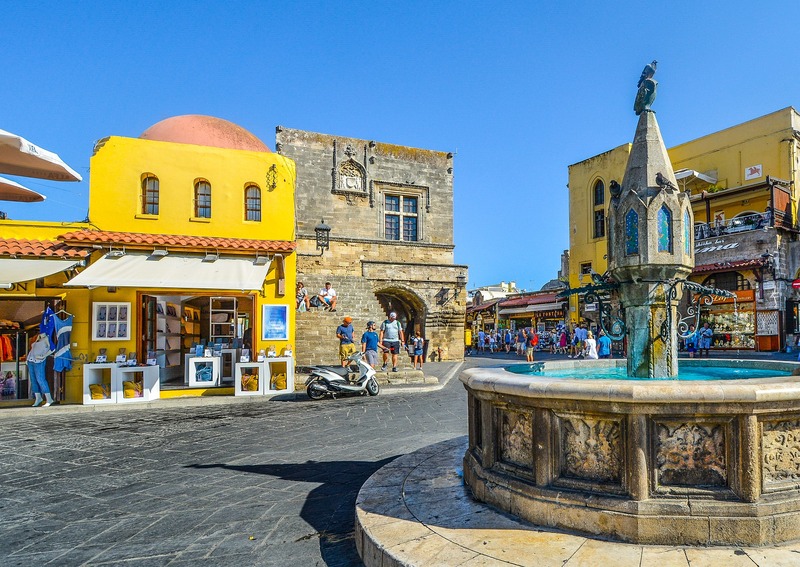 And of course, leave time for wandering in the hidden alleys of Rhodes Town, and tasting the traditional local specialties that reflect this coveted island’s long, complex history. 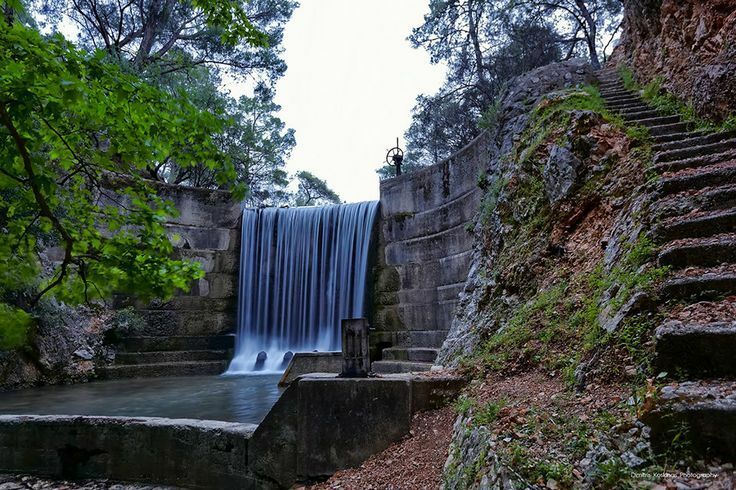 When the glorious sun becomes simply too much, locals head for Epta Piges– “seven springs”. Join them and cool off in the shade of Plane Trees and Pine trees by a cool babbling brook. Enjoy some traditional Greek food and then check out the man-made lake- accessible through a 150m long tunnel. 15 km outside of Rhodes Town, this hill offers not just fantastic view of the Aegean as it stretches to the coast of Asia Minor, but also a place of religious interest. An Early Christian basilica and a small Byzantine church are open to visitors, and the romantic atmosphere make this a popular spot for weddings. 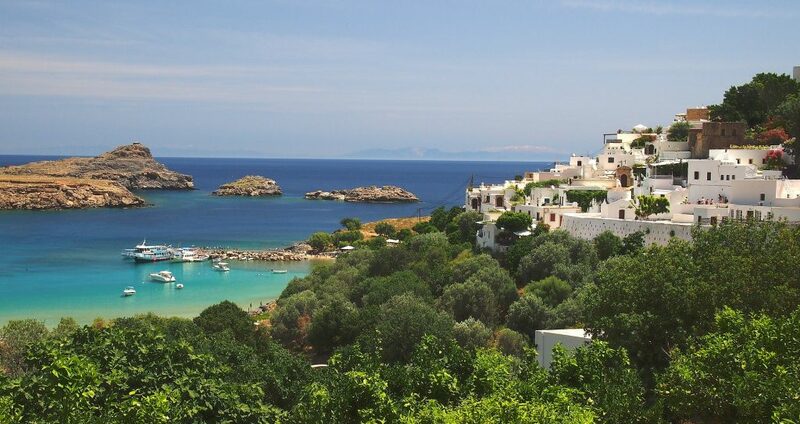 Less than 49 km south of Rhodes town is a lush green village set in a forest- Eleoussa. 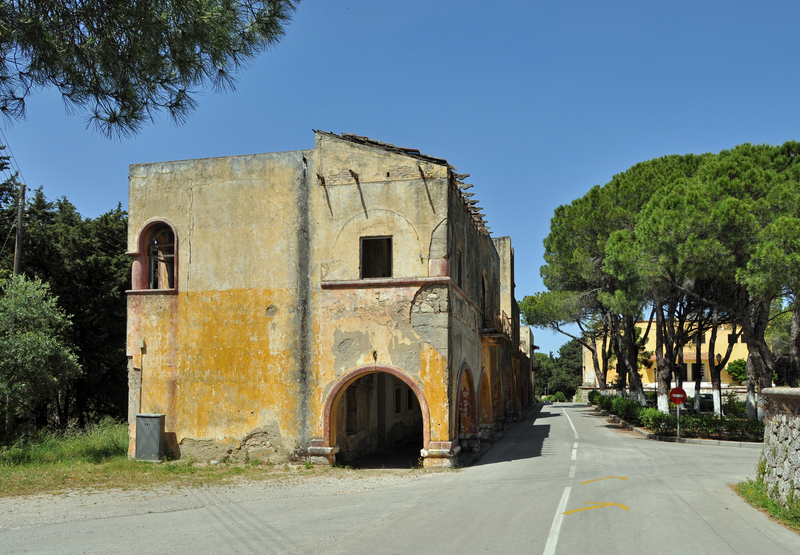 The village was settled by Italians, and it was they who replanted the forest. Among the monuments they left are an old sanatorium, and an aqueduct on the hill. 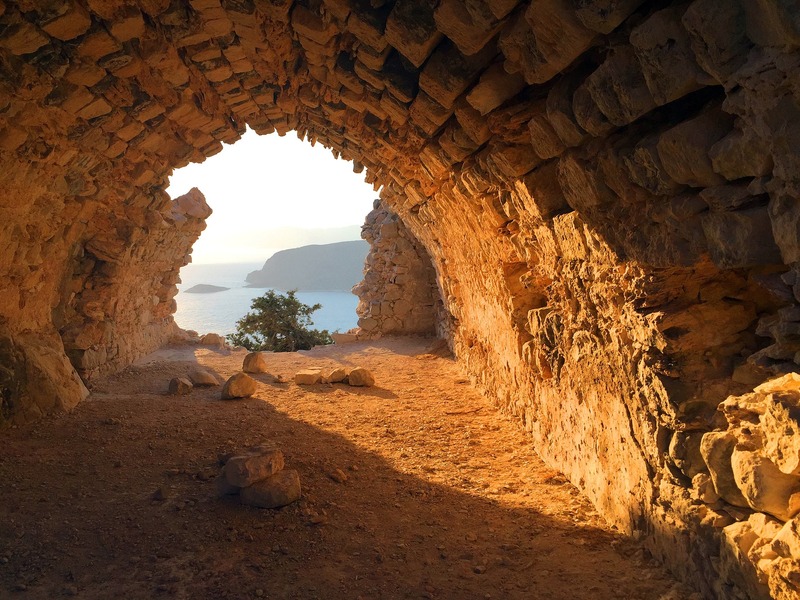 Among the many monuments left by the Knights of St. John, the castle of Monolithos warrants a visit. Its location gives its name-the castle was built atop a 100 m high rock, in 1480. Climb the steps carved in stone to the top for splendid views of two islets and light a candle in the chapel of St. Panteleimonas. Just south of the village of the same name, Krininia Castle was also built by the Knights of St. John, in 1472. 130 m up on a rocky hill with 360 views, it’s beautiful to visit. It was also an important fortification, and held out the Ottomans — they were unable to capture it during a siege despite outnumbering the knights considerably. On the south coast of Rhodes and far from the swirl of activity of Rhodes Town is the charming seaside village of Lachania. Traditional architecture- houses of clue with white trim and tiled roofs- and a classic town square with cafes, give a sense of serenity. The village is at the foot of a hill and has a long and unspoiled beach. The hillside village of Asklipio is full of more historic charms. Life here centers around the square in front of the Church of the Dormition, built in 1060 and recently restored — the Byzantine frescoes are extraordinary! The church’s old olive press now houses a small folklore museum. Uphill, visit the medieval fortifications and enjoy sweeping views of the beaches. Rhodes is world famous for its beaches, with many choices offering a variety of experiences. This wild, pebbled beach 45 km from Rhodes Town on the southwest coast is known for its fantastic rock formations and incredible waters. Bring water, an umbrella, and anything you might need; it’s an unorganized beach. Limni is a long stretch of beach on the southwest coast. You may find a Cantina and umbrellas in the high season, otherwise it is fairly unplanned and wild. Its remoteness makes it a popular choice with Naturalists- so if you want a day to really commune with nature, this a good choice. Also called Stegna, this beach is popular with those who want a peaceful atmosphere but with some welcome signs of civilization- watersport facilities, tavernas, and some rooms for rent. 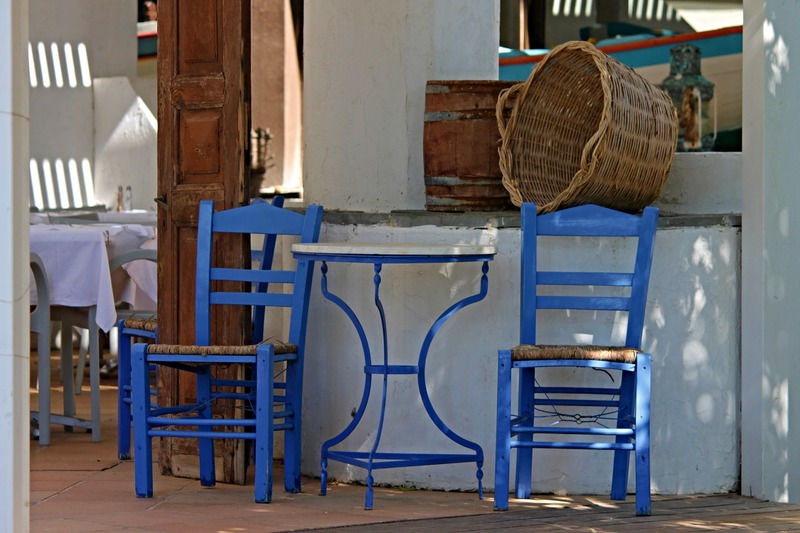 Tranquil, unspoiled and very low key, it is about 30 km from Rhodes Town. “Nisi” is “island” in Greek, and these two beaches, both called “Green Island” are in fact on- almost- a tiny island- attached by just a small strip of land in the south of Rhodes, about 90 km from Rhodes Town. Silky fine sands and shallow waters near the shore make both child friendly. 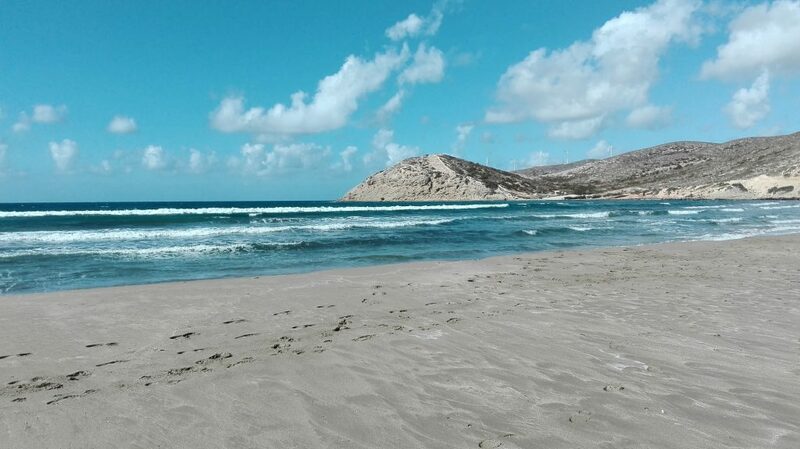 The eastern side beach is usually calm, and the west side more windy- great for kitesurfing and windsurfing- schools and centers on the beach. Restaurants and a mini market are nearby. 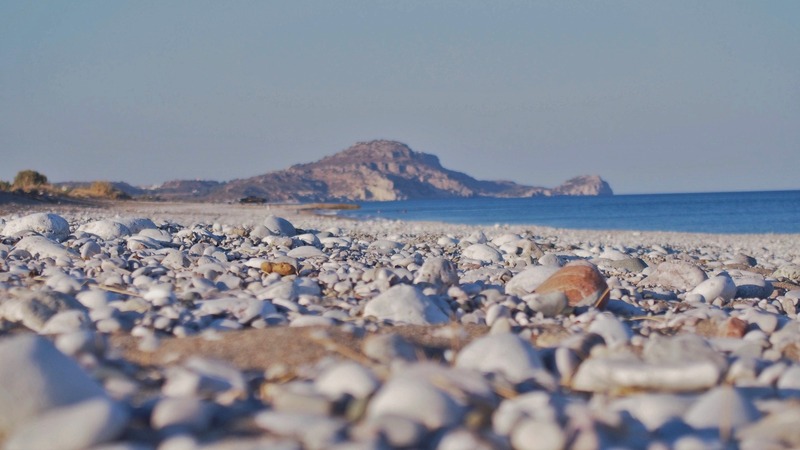 Right below Monolithos, about 80 km from Rhodes Town, this wild beach, pebbled and often wavy, is a popular place to watch the sunset. It’s particularly dramatic from here — the cliffs catch the deep gold rays of the sun and the whole beach is aglow. 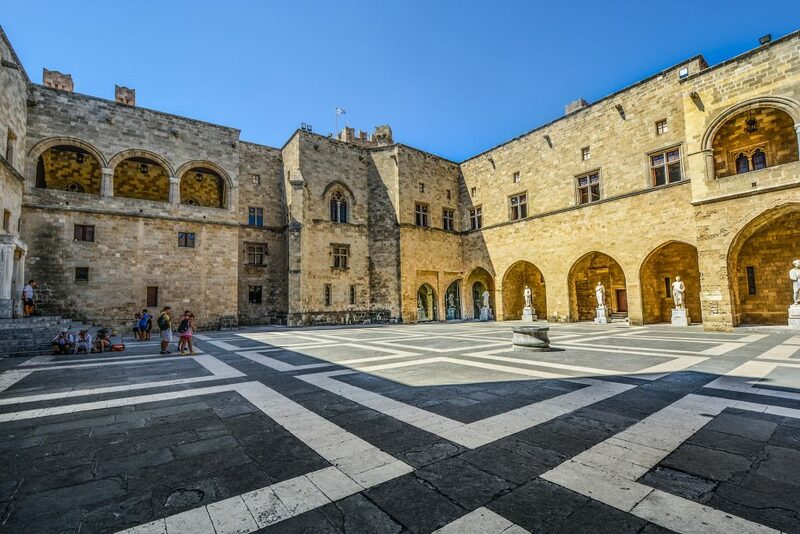 Rhodes’ Old Town is full of landmarks of beauty, especially the Palace of the Grand Master. But the whole medieval wonder is a UNESCO world heritage site. 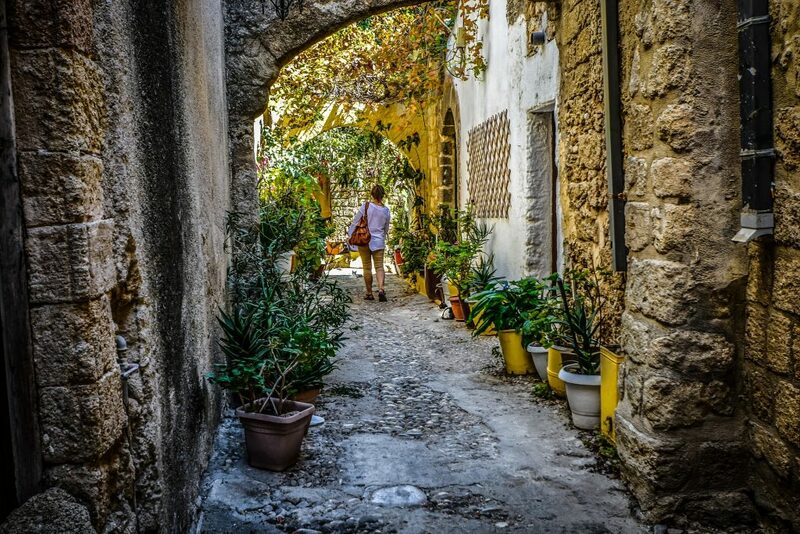 A great way to enjoy it is to get lost among the rambling stone alleys- as you surely will. Come upon charming squares, doorways, and cascades of bougainvillea and be transported into the past. Don’t worry- this is a wonderful place to eat. Imagine a Greek Island that was inhabited by Italians for years. The complex history translates into very special regional dishes. The island’s produce and fresh fish are unbeatable. Enjoy a seaside seafood feast, or maybe you feel like some comfort food, Rhodes’ style, like “Hilopites”- a home-made, hand rolled pasta served with a tomato sauce or meat. For dessert, try some “Melekounia”- this is an exotically spiced version of the sesame and honey candy popularly known (in its unspiced version) as “pastelli”. When you travel, do you prefer the main hotspots, or the out of the way surprises?